Scarsdale Sutton: a glorious ruin that has haunted me ever since I first saw it from the M1 in Derbyshire. And so it became my inspiration for my Regency country estate Northam Park in Notorious Vow. 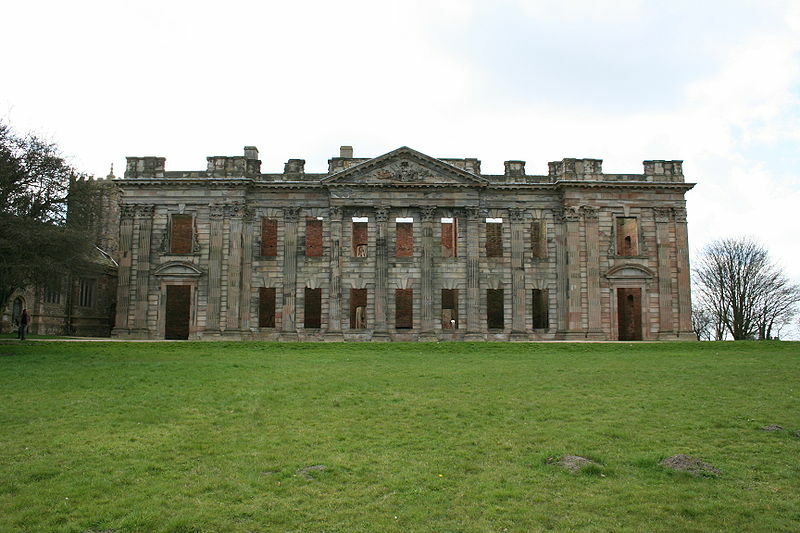 Its similiarity to the design of Chatsworth, that perennial favorite English country house prominently featured in the 2005 articulation of Pride and Prejudice, is striking. Northam Park displays the same frowning facade of Scarsdale Sutton which Vivien notes as she observes the rendering of Russell’s country estate in watercolor side by side with his other rural domain, Wimberley. She remarks upon the melancholy demeanor of the mansion, which the earl decries as ungodly. Northam Park is Diana’s now. What she intends to do with it is, perhaps, a subject for a later book. This entry was posted in Notorious Vow, Regency and tagged Sutton Scarsdale Chatsworth Northam Park by Angelyn. Bookmark the permalink. I love reading about the places that inspired your novel! Very interesting stuff.